A question we often receive is whether or not the Pure Hemp Botanical Tinctures are made for ingesting ONLY and the answer is NO! Our tincture can be used for an array of things as a topical solution. From insect irritations and minor skin complaints, it can be used in so many ways! One of my personal favorites is mixing it with essential oils as a massage lubricant. After a long day of chasing a toddler, rounding up chickens and dogs or even a weekend of heavy lifting around the house a massage is almost always my go to. I thought this week I would share some of the pointers we’ve learned along the way that have helped our at-home-massage experience immensely! -To start we always use essential oils, some extra hemp or coconut oil and a Pure Hemp Botanicals tincture. I tend to just use the tincture on a specific area instead of using it all over during a massage. Shoulders aching a bit today? Rub some tincture on them. I also almost always put a few drops at the base of my spine when working on neck tension. Then I use the carrier oil of my choice and some essential oils over the whole area. -Always avoid boney areas like the spine and focus more on “empty space” where you would find the muscles between the bone. – Use your body weight and gravity instead of using force. This will help your stamina as well as keep your hands and arms from getting tired. -Avoid pinching and squeezing muscles. That it is helpful to pinch or squeeze an aching muscle is a common misconception, gentle kneading and pressure are enough. Think of it like sculpting! Most of the techniques we use I actually found in an article on Lifehacker! The whole article can be found here https://lifehacker.com/5871832/how-do-i-give-better-massages but these are some pointers that have helped us a lot! “How to massage the neck and shoulders: Make a soft (loose) fist and use the base of your hand to apply pressure on her left shoulder, running your hand up the side of her neck until you get to the base of her skull, then go back down. Without breaking contact, repeat on the other side. Do this a couple of times. Lifehacker also had some great tips for those times when you don’t have a second set of hands to help as well! I tried a few and of the list in the article these were my favorite. “Feet: Athletes are familiar with this trick: Roll your foot on a tennis ball or golf ball, moving side to side and from toes to heel. Spend more time in the sensitive foot arch area. 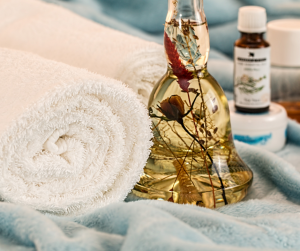 While we don’t use massage in our home to treat any serious issues it is definitely an amazing tool to help relax, refresh and generally loosen up our muscles. Adding the Pure Hemp Botanicals Tincture has just made it that much more amazing!